Like our last post, this is also a historical venue that is now a commercial premises. Although it is very close to the CBD, most people would be unaware of its existence, let alone its history. Francis Curnow arrived in Brisbane in March 1860 at the age of twenty and went to work as a clerk at Cribb and Foote in Ipswich, before becoming a pay clerk for the Roads Department. From there he moved to the Railway Department, eventually becoming chief clerk of the railways. This job brought him to Brisbane in 1877 and he purchased from James Gibbon an allotment near the site of Roma St railway station on which to build a house. This is the house, known then as Hellesvere. Francis Curnow went on to become Queensland's third commissioner for railways, retiring in 1889. Tragically he lost a twenty year-old son who drowned in a "swimming baths" in 1900, and Francis himself died in 1901. The house remained in the Curnow family until 1909. In the 1930s Hellesvere was purchased by a Mrs Curtis who renamed the residence Eton and operated it as a boarding house. 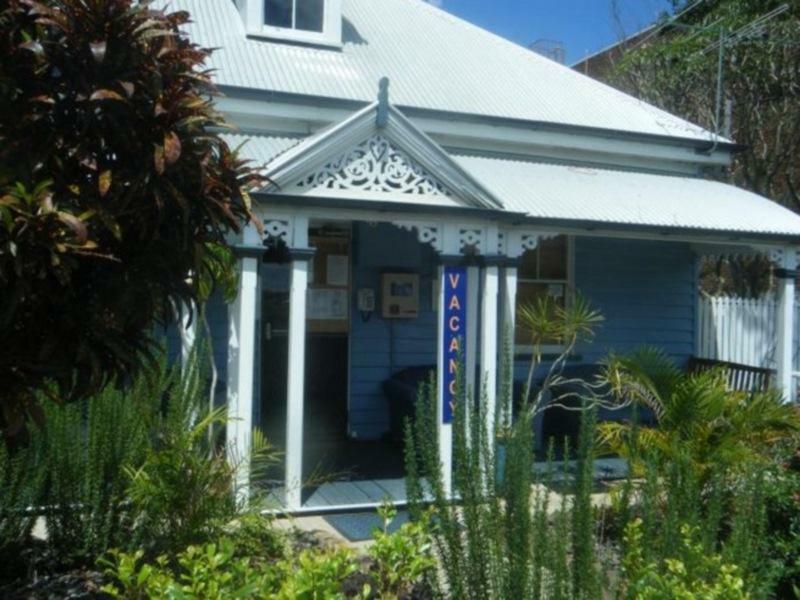 The building is still called Eton, and operates now as a bed and breakfast venue in the heart of Brisbane's backpackers accommodation quarter. I'm thoroughly enjoying your blog, you portray our Brisbane beautifully! It is wonderful to see my great-grandfather's home still in use and in such good condition. He would be amazed to see the transformation of his neighbourhood into part of the CBD. Alas, his river views have been built out. Although the surrounding buildings are somewhat different than back when your great-grandfather's day, his house still holds its own. This is a beautiful home, but it has architectural elements that make it different from 1870s houses in Victoria. So either Brisbane had its own architecture elements or a later family added the attic window, the columns in the front etc.